On December 17, 2018, Heart Evangelista released a travel vlog featuring BFF Lovi Poe during their vacation in Amanpulo, Palawan! We learned a couple of things from it, like it being the same place where Heart and Senator Chiz Escudero went on honeymoon, Heart wants to achieve Lovi's "tan," and the besties basically come up with all kinds of crazy "shenanigans" whenever they're together! There's a scene (skip to the 7:09 mark) where Heart and Lovi are just passing around this huge...shell, and taking turns adding it to their outfits. "What's the first thing that you think of [when you see this]?" Heart asked, holding it up for the camera. They took turns using it as an oxygen tank, a telephone, a hat, a large brooch, and a dinosaur head. LOL! 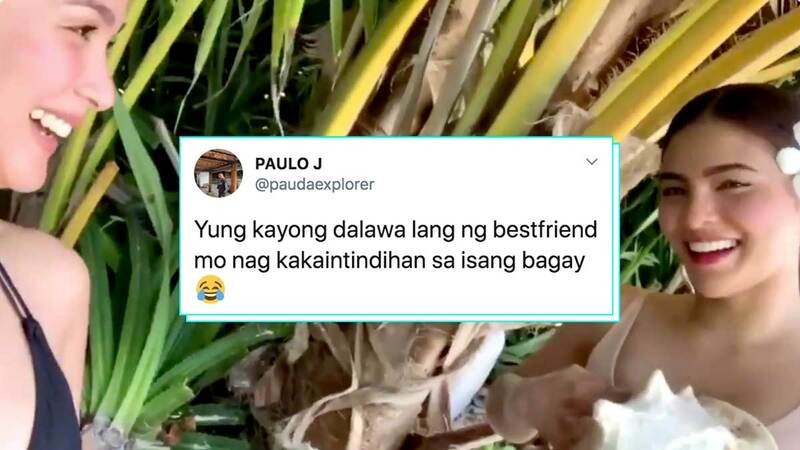 A fan took a screen recording of the scene and tweeted it, saying, "Yung kayong dalawa lang ng best friend mo nagkakaintindihan sa isang bagay." Because it's so relatable, the video has already gotten over a million views! You guys are sooo cute, Heart and Lovi! We can't wait to see more behind-the-scenes moments of your awesome friendship.